Place a medium pot over medium-high heat with one turn of the pan of EVOO, about 1 tablespoon. Toss the jalapeños into the pan and cook until tender, 3-4 minutes. Add in the rice and cook about a minute (you’re toasting it, so it’s ready when it starts to smell nutty). Add in 2 1/2 cups stock and bring up to a bubble. Turn the heat down to medium-low and simmer the rice until tender, about 20 minutes. Make the “green” part of the rice by pureeing together the baby spinach, cilantro and remaining stock (about 1/2 cup) in a food processor (ask a grown-up helper for assistance with the food processor, if you need it). Dump the mixture into a dish and reserve it until the rice is finished cooking. 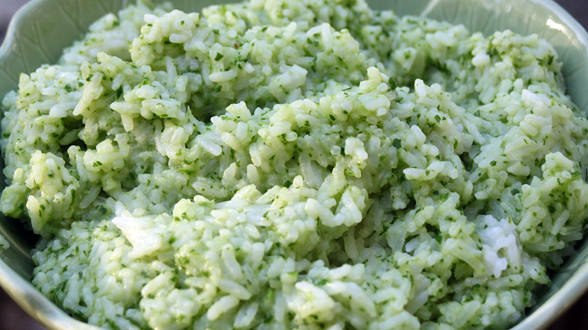 When the rice has finished cooking, stir in the green sauce and transfer the rice to a serving bowl or platter. In Recipes-list.com we have selected the most viewed recipes from category - uncategorized . Enjoy the best recipes specially selected for you! Green Rice is the right choice that will satisfy all your claims.